The first women’s yearbook at the University of Pennsylvania dates to 1912 when a group of women from the Class of 1913 prepared a manuscript record of thirty pages. The volume includes a dedication from members of the Class of 1913, a list of the featured Class of 1912 members with brief descriptive quotes, a poem, a prophecy, autographs, and photographs. All copies were prepared by hand, with prints of photographs hand-pasted to the pages. 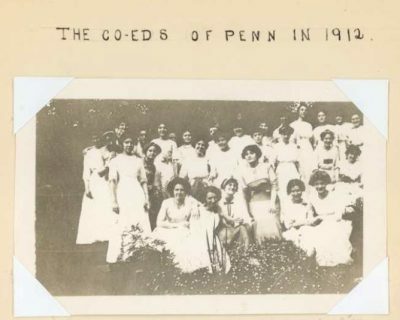 The young women identified in the photographs include some of these members of the Class of 1912 as well as 22 women who were members of other classes at Penn. At least ten female members of Penn’s undergraduate class of 1912 are NOT mentioned in this record. The omissions include two women who earned their Bachelor of Arts degrees (Emily Foulkrod and Michele Frasca), two women who earned their Bachelor of Music degrees (Josie M. Holton and Florence Emily Taylor), and six women who earned their Bachelor of Science degrees (Alice Potter Ervin, Mary Thornton Haydock, Anne and Elizabeth Linton, Adeline Kerr Merritt, and Mary Craig Peacock).